The record is made up of 1 volume (189 folios). It was created in 18 Jun 1900-5 May 1920. It was written in English and Arabic. The original is part of the British Library: India Office The department of the British Government to which the Government of India reported between 1858 and 1947. The successor to the Court of Directors. Records and Private Papers. This file contains correspondence between British officials at Bushire, Bahrain and the Foreign Department of the Government of India, as well as with Shaikh Jāsim bin Muḥammad Āl Thānī, Shaikh Aḥmad bin Muḥammad Āl Thānī and Shaikh ‘Abdullāh bin Jāsim Āl Thānī. The first part of the file covers Britain’s relations with Qatar between 1900 and 1905, and includes: details of gift giving to members of the Āl Thānī family in 1900, 1903 and 1904; details concerning Turkish activities in Qatar; various correspondence among British officials discussing the status of Qatar vis-à-vis Britain and possible future treaty relations; the status of the Āl Thānī family as the ruling family of Qatar; the position of Shaikh Aḥmad vis-à-vis his brother Shaikh Jāsim; and a short historical sketch of Qatar from 1766 to 1902 (folio 44). The pages of the file that cover the years 1905 to 1909 include Fancis Beville Prideaux's report on his visit to Shaikh Jāsim at Lusayl and Shaikh Aḥmad at Doha (al-Bidda‘) (folios 49-59) in November 1905; details concerning the murder of Shaikh Aḥmad in December 1905 (folios 60-76); Turkish activities in Qatar (for example, folios 92, 95 and 102); illness of Shaikh Jāsim’s son, ‘Abd al-Raḥman, in March 1906 (folio 71); piracy activities of Aḥmad bin Salmān (folio 82); and the Āl Thānī family’s relations with Ibn Sa‘ūd (folios 114-117A) and the Āl Khalīfah family (folios 119-127). 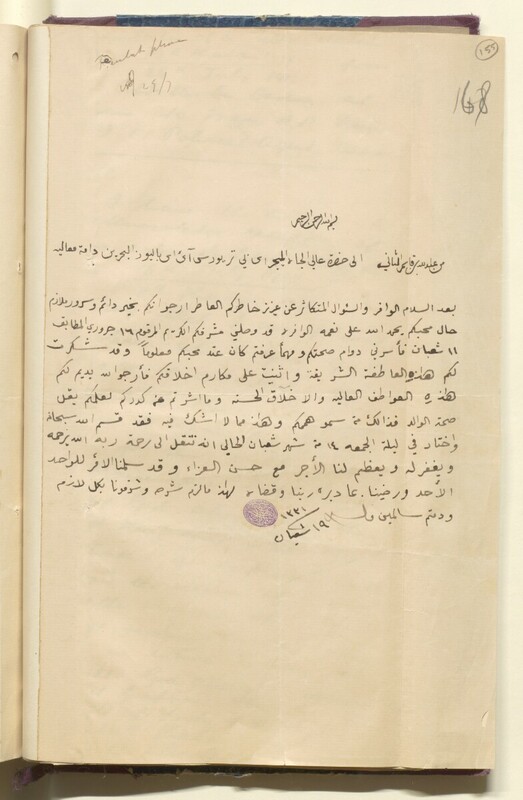 The pages of the file covering 1913 to 1920 deal with Shaikh Jāsim’s illness and eventual death in July 1913 and the subsequent succession of his son, Shaikh ‘Abdullāh (folios 147-156); details of relations between the Āl Khalīfah family and Qatar, particularly with regard to al-Zubārah (folio 157) and their pearling interests; and a proposed tour of Qatar and the awarding of the C.I.E. [Companion of the Order of the Indian Empire] to Shaikh ‘Abdullāh (folios 157-181). Foliation: This file has a foliation number in the top right hand corner of each folio. The number is enclosed by a circle.